Mark Hopkins, sales representative with ReMax Twin City Realty. shows off space in the Boehmer Box building that is being renovated. KITCHENER — Mark Hopkins walks on glistening hardwood floors flanked by yellow brick walls that are punctuated with metal framed windows, and decorated with historic photographs of the city. It is a stunning transformation of the second floor of the Boehmer Box building at the corner of Duke Street West and Breithaupt Street. The building is being marketed to startups and small businesses looking for low-cost, brick-and-beam space in the downtown area. The industrial behemoth at 283 Duke St. W. is commonly known as the Boehmer Box building even though the cardboard packaging company used it as a warehouse for just a brief part of its 120-year history. As a sales representative with ReMax Twin City Realty, it is Hopkins’ job to lease out the 135,000 square feet of space, evenly spread over three floors. In the past six months, tenants have leased about 10,000 square feet. 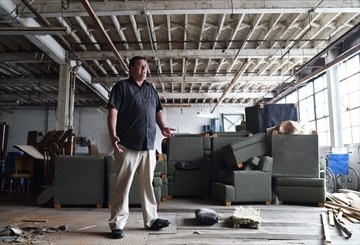 It is the latest of the old former factories in Kitchener centre to undergo redevelopment. Unlike the high-profile restorations of the Lang Tanning building, now known as the Tannery, and the nearby Breithaupt Block, the Boehmer Box building will be renovated as leases are signed. In the last three months of 2015, Hopkins oversaw a major cleanup of the building and the renovation of the common areas on the main floor. “We had 30,000 square feet of hoarded material from all of the different units on all three floors that we had to get rid of before we could even attack some of the common area space,” Hopkins says. LED lights replaced old ballast fluorescent lights. The hardwood floor in the main-level hallways was uncovered and restored. Metal window frames from the exterior are being replaced with new windows. The old ones are being restored and installed in the interior brick walls. Drywall, plaster and paint were removed to expose brick walls that were sandblasted. “When we walked in here, everything was grey or white,” Hopkins says. Hopkins, acting for owner Krishan Judge, moved out many of the occupants of small units in the building — recording studios, jam halls for musicians, artisans and at least one homeless squatter who was living in a small room on the third floor. Off the central corridor on the second floor is a large room that is called the co-share space. Individuals or startups rent chairs and work in an open light-filled office. The furniture came out of The Walper Hotel, which is undergoing a major renovation. Electrohome, the renowned consumer electronics company founded by Arthur B. Pollock, operated in the building longer than any other business. So Hopkins is trying to get permission to use that name and rebrand the building as the Electrohome Business Centre. He has conceptual drawings for a lobby to be built where loading docks are located at the back of the building off Breithaupt Street. The loading dock doors will be replaced with big windows; a rooftop patio will look out at the transit hub that will be built at King and Victoria streets. The exterior walls will be sandblasted and the windows replaced. There is a different vision for each floor. The ground floor is for small businesses. Currently, the tenants include an interior decorator, a mixed martial arts studio, a Zumba fitness centre and the community radio station SoundFM at 100.3 FM. The second floor, described as the main floor by Hopkins, is designed to be office space for startups and other businesses. Tenants include Nicoya Lifesciences and the environmental publication Alternatives Journal. The third floor has been left alone. Hopkins says it is the biggest industrial space in the city centre available for redevelopment. He hopes a large technology company will eventually take the entire floor. “Once we have the second and first floors finished, we will be the only brick-and-beam building that is going to be cool downtown with access to the transit hub with a 45,000-square-foot plate,” he says. Two parking lots on Breithaupt Street have 36 spaces. There is more parking between the building and the adjacent railway tracks. Judge also has a one-acre parking lot two blocks away. Space is leasing for $16 a square foot. That covers rent, common-area maintenance fees and utilities. Hopkins says other brick-and-beam office space in the core leases for $25 to $39 a square foot. “We are affordable, that’s the key here,” he says. Hopkins says Judge, who bought the building in 2004, has rejected all offers to buy the building and is redeveloping it in stages. “He doesn’t have $50 million to throw at it and turn it into a Taj Mahal; he does things step-by-step, at his pace, but when it’s done it is going to be done right and it is going to look fantastic,” Hopkins says. David McConnachie, business manager of Alternatives Journal, jumped at the opportunity to lease space on the second floor. The magazine was previously at King and Gaukel streets. The idea of reusing an old factory in the city centre resonates with environmental publication’s core messages. And “the affordability is where we needed to be,” McConnachie says. The magazine’s 10 employees can easily get to work by bicycle, transit or walking, he adds. Amanda Baechler recently moved her interior decorating business, Designs by Amanda, into 1,000 square feet on the first floor. “It is a very cool space,” she says. The business used to be in Baden and catered to suburban homeowners. With the revitalization of downtown Kitchener, Baechler wanted to set up shop in the core. As old factories and homes are being restored, Baechler sees a huge opportunity for her interior design business.